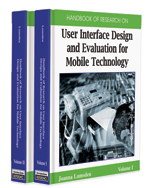 This chapter presents a usability evaluation method for context aware mobile applications deployed in semi-public spaces that involve collaboration among groups of users. After reviewing the prominent techniques for collecting data and evaluating mobile applications, a methodology that includes a set of combined techniques for data collection and analysis, suitable for this kind of applications is proposed. To demonstrate its applicability, a case study is described where this methodology has been used. It is argued that the method presented here can be of great help both for researchers that study issues of mobile interaction as well as for practitioners and developers of mobile technology and applications. Data Collection: The process of gathering raw or primary specific data from a single source or from multiple sources. Data analysis tool: A software package that supports extracting meaningful information and conclusions from collected data. Context Aware: A device, a system, or an application that has the ability to sense aspects of context and change its behaviour accordingly. ActivityLens: A usability analysis tool used to support usability studies for mobile and collaborative applications analyzing multiple media data. Screen Recording: The operation of capturing the output of a devices’ screen. Context: Any information that can be used to characterize the situation of an entity. An entity should be treated as anything relevant to the interaction between a user and an application, such as a person, a place, or an object, including the user and the application themselves. (Dey, 2001). Usability Evaluation: The process of assessing the usability of a given system or product. Semi-Public Space: A place which is public to people and imposes a set of common, and universally acceptable rules regarding their behaviour i.e. a museum, library, theatre.